I am slowly unpacking my suitcase and getting settled back home but as I have uploaded my vacation pics on the pc I have a few vacation manis to share. The first one is my favourite as it looked fabulous and it lasted me for a whole week (I took this off just yesterday after it was ruined by dragging my suitcase around). 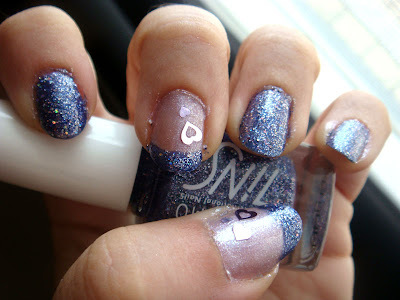 For this manicure I used Estessimo Tins #023, The Neptune and Jill Stuart 17, Purple Rain. Also added some purple heart spangles and sealed it with a layer of gel look top coat that I got in Japan. welcome back :) theese look amazing :)the purple glitter is so cuute! @Kayleigh I actually use Sally Hansen's Kwik Off so the glitter was removed without any trouble. Orelse I wouldn't even want to think about it. @Just Cake girl thank you :) Tins is actually one of my favourite brands for glitters, it's a pity this brand is so hard to get. It's so nice to have you back! =) Wow the Tins glitter looks so dense and glittery. And it lasted for a week?? That's awesome! The mani is gorgeous btw and the Jill Stuart is just screaming out "buy me".. I'm a total sucker for pretty bottles and these have to be one of the prettiest. I can't wait for your other Japanese polish manicures! ^___^ awwww thank you my lovely. Tins is an amazing brand. I have this as a pedi too and it is still going strong almost two weeks later. love tins !!! where do you buy it ? I got these while travelling in Japan. I am gonna look for online shops to get them, if I find anything I will definitely make a post as they are totally worth it.